US, 2018, 96 minutes, Colour. The title is very plain. This is a film about a battered yacht adrift in the northern Pacific Ocean. There have been a number of films in the adrift brain, about a decade ago several with people drifting in danger of shark attacks. In more recent times, Robert Redford was All at Sea, and Colin Firth was attempting a round the world record in Mercy. 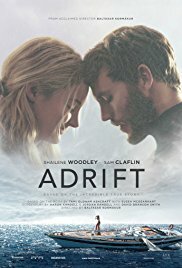 This time the person adrift is Shailene Woodley, Tami Oldham, who does appear as herself at the end of the film, the film based on a true story. Tami had a hard upbringing in San Diego but left home and became a very happy-go-lucky young woman, happily drifting around the world from temporary job to temporary job, finding herself in Tahiti. However, the film opens with the disaster for the yacht, her coming to consciousness, and searching for her partner, Richard Sharp, played by Sam Claflin. The film goes into flashback, establishing Tami’s character, her chance meeting with Richard, their enjoying each other’s company, a growing bond, falling in love – shown with quite some tenderness. The structure of the film is that it keeps moving backwards and forwards, keeping the tension about the yacht being adrift in balance with the background story and the romance. Richard is asked by a wealthy couple to sail their yacht to the United States and he agrees, especially with Tami as his partner. It is only at the end of the film that we actually see the vast storm that wrecks the yacht. In the meantime, we have very strong leading character, a strong female character at sea, with the physical strain, the psychological strain, the emotional strain that keeps her going for more than 40 days adrift. But, she is sustained by her relationship with Richard, her working with him, her caring for him. Stories about people adrift at sea may not have a great appeal to non-sailors. However, Icelandic Dir Baltazar Kormakur retains the tension between the past and the present, has great admiration for Tami and her story. 1. The title? Literal? Based on a true story? 2. Stories of survival at sea, human spirit? The role of hallucinations and moral encouragement? 3. The structure, intercutting of Tami being adrift, the background story? 4. The locations, the Pacific, the sea and its moods, the quality of the photography? The musical score? 5. The yacht, the interiors, exteriors? Views of sailing? The experience of the storm? 6. The introduction, Tami adrift, Shailene Woodley and her screen presence? Her age, behaviour, waking, the situation of the yacht, the water, having to cope, strength, ingenuity, knowledge? Her imagination? Richard, rescuing him, caring for him? Supplies of food and water? her calculations? Richard and his wounds, sewing her own wound? Being vegetarian, spearing the fish? Eating the fish? The flares, the boat in the night? 7. The indication of so many days adrift? Richard, the rescue, on the deck, his wounds, his talking with Tami? His disappearance? 8. The past, Tami and her life in San Diego, her mother at 15, her father? Richard, the death of his mother? Naval background? Tami taking off, finding herself in Tahiti, the odd jobs, her talking to the official, staying indefinitely? Richard arriving, his help, the bond with him? The attraction, the outings, the discussions, jumping off the cliff? Lyrical, romantic? 9. Richard, strong character, sailing, his going around the world? The bond with Tami? In love? 10. The prospect of taking the yacht to San Diego, the discussions with the owners, the fee, the promise of the ticket? Tami going with him? 11. The build-up of the voyage, working the boat together, bonding? The proposal? Coping with the difficulties, the storm, the cyclone warning? 12. The storm and the destruction coming at the end of the film? 13. Tami, adrift, the image of the bird and the indication of land? Her coming ashore, the rescue? 14. The memory of Richard, her survival? 15. The actual Tami, photos, video clips, her continuing to sail?